Yup, “chocolate rice”…have you ever heard of such a thing? My family grew up eating this stuff…it’s so tasty. We didn’t make it much at our house alone, but whenever we visited our cousins (who were also Filipino) in Atlanta, we’d ALWAYS make this stuff and chow down on it all day. I’d kind of forgotten about it until my mom reminded me of it a few months ago. Usually when I think of “dessert rice,” I think of the “sweet rice” dish we ate all the time for special events and holidays and pot-luck get togethers, but I’ll save that for another day. The chocolate rice is a really easy dessert to make, but I always thought it was something our families just made up. 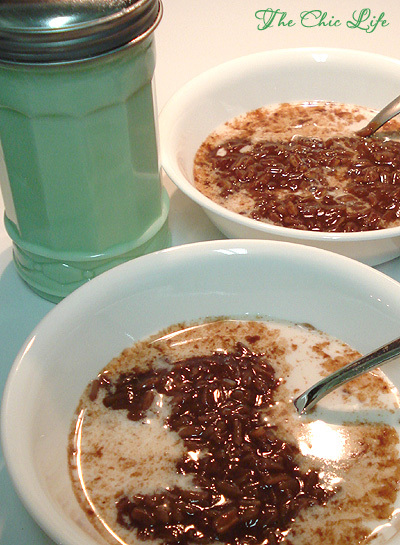 Imagine my surprise when browsing the web to find that it may, in fact, be authentic – a dish called Champorado. Who knew? Ok, ok, so our version isn’t all the way authentic, but it’s pretty close and we like it. 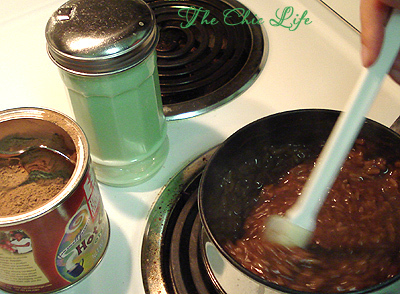 The rice is cooked over the stove top, then hot chocolate mix is stirred in and…done! It’s that simple. Depending on the type of mix, we’ll add sugar to the dish, too, but it’s all up to the chef. The rice is usually served with a little bit of evaporated milk – it makes it extra creamy. I love chocolate rice, especially during colder months, because the rice is so soothing and just warms you up with sweet, chocolate-y comfort. As you can tell, I love your blogs and I love interesting recipes ESPECIALLY CHOCOLATE ONES!! Can you tell me, when you say one part rice is that equal to a cup or half a cup? I want to try making this over the weekend. Is the chocolate rice served as a cold dessert or hot? I can't wait to try this!! Thanks!!! I just wanted to write and tell you how much I love your blog: the pictures, the colors, the projects, the recipes. I am just in love with it all. Thank you for brightening my day! if only there wouldn't be storm outside I would ride my bike to the Asian food store right this minute! Yummy! This looks so tasty and seems so very easy to make! Thanks for the recipe – I'll have to try it. It looks like the ultimate comfort food! I haven't heard of this, but since I am obsessed with all things sweet and eat rice at least once a day, it's on my list to try! I have a question. What do you mean when you say parts?